Delving into a detailed account of the new C++11 standard and its applicability to computational finance. Using de-facto standard libraries, such as Boost and Eigen to improve developer productivity. Developing multiparadigm software using the object-oriented, generic, and functional programming styles. Designing flexible numerical algorithms: modern numerical methods and multiparadigm design patterns. Providing a detailed explanation of the Finite Difference Methods through six chapters, including new developments such as ADE, Method of Lines (MOL), and Uncertain Volatility Models. Developing applications, from financial model to algorithmic design and code, through a coherent approach. Generating interoperability with Excel add-ins, C#, and C++/CLI. Using random number generation in C++11 and Monte Carlo simulation. 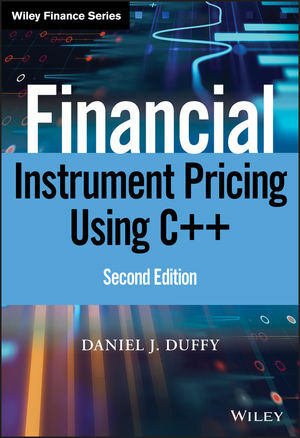 Duffy adopted a spiral model approach while writing each chapter of Financial Instrument Pricing Using C++ 2nd Edition: analyse a little, design a little, and code a little. Each cycle ends with a working prototype in C++ and shows how a given algorithm or numerical method works. Additionally, each chapter contains non-trivial exercises and projects that discuss improvements and extensions to the material. This book is for designers and application developers in computational finance, and assumes the reader has some fundamental experience of C++ and derivatives pricing. Once you have purchased a copy of the book please send an email to the author dduffyATdatasim.nl requesting your personal and non-transferable copy of the source code. Proof of purchase is needed. The subject of the mail should be “C++ Book Source Code Request”. I will send a reply with zip file attachment.